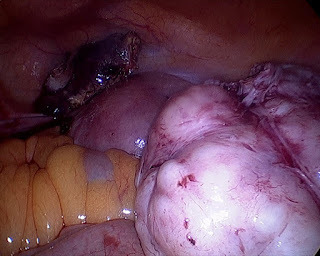 Incidence of uterine leiomyoma is approximately 2% in pregnant women. Traditionally obstetricians are trained to avoid myomectomy during pregnancy or cesarean section due to fear of severe bleeding often necessitating hysterectomy. Here we present a case of ectopic pregnancy managed laparoscopically along with laparoscopic removal of an intramural fundal fibroid of about 5 x 6 cm in the same sitting. The classical clinical triad of ectopic pregnancy is pain, amenorrhea, and vaginal bleeding. Unfortunately, of that, only 50% of patients present with all the 3 symptoms. About 50% of patients with ectopic pregnancy have vaginal bleeding, 50% of patients have an adnexal palpable mass, and 75% of patients have pain and abdominal tenderness. In one of the case series published, that of ectopic pregnancies, abdominal tenderness and pain was presented in 98.6% of patients, amenorrhea in 74.1% of patients, and vaginal bleeding in only 56.4% of the patients. The blood loss during a myomectomy is usually severe during pregnancy as the size and blood supply of the myoma are increased in pregnancy. In most cases it is wise to defer myomectomy for preferably 6 months after pregnancy. Pedunculated fibroids on the other hand can be easily removed, and are an exception. A 35 year old female came to our outpatient department with chief complaints of pain in abdomen with 6 weeks amenorrhea. She had previous one normal delivery 8 years back. A urine pregnancy was done which was positive and an ultrasonogram showed an ectopic pregnancy on the left side with an empty uterine cavity along with an intramural fibroid on the right uterine wall of about 5 by 5 cm in size. On asking about the past history, she had also complained about severe dysmenorrhea since 1 year for which she was on some medications since 2 months. 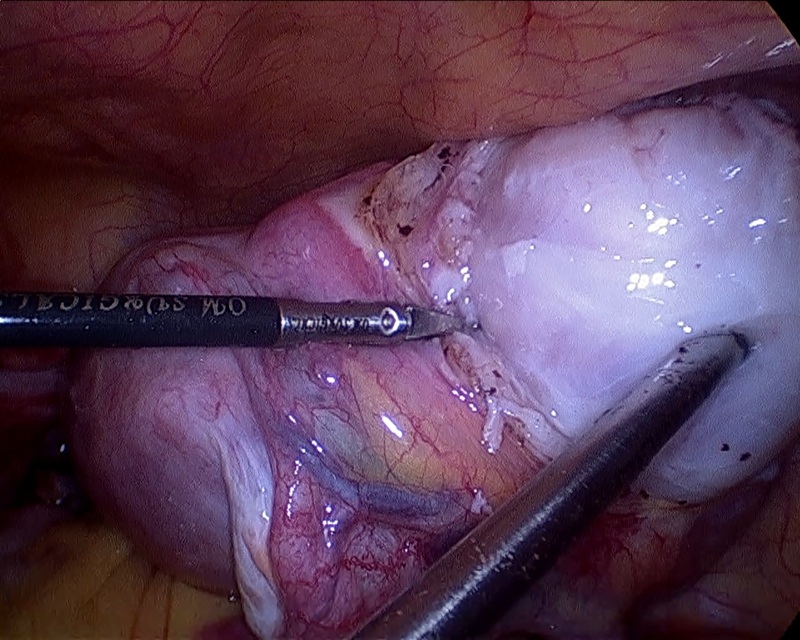 A decision for laparoscopic exploration was taken. 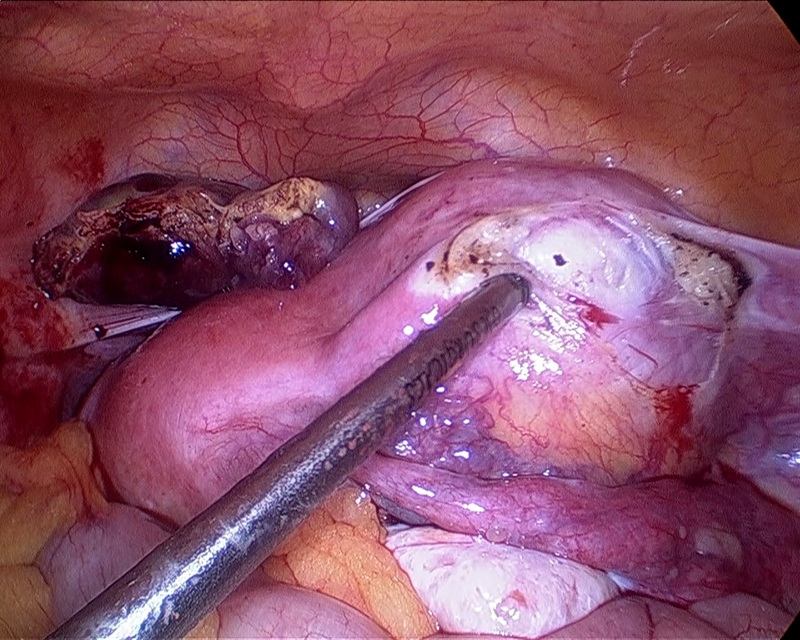 A left tubal ectopic pregnancy was seen; left side salpingectomy was done. Figure 1. Left tubal ectopic pregnancy and fibroid arising from right lateral wall. Figure 2. Fibroid capsule opened. A fibroid of about 5 by 5 cm was seen jutting from the right sided uterine wall. Injection vasopressin was injected around the fibroid and removed with a myoma screw; minimal bleeding was encountered. Myoma cavity was sutured in 2 layers and haemostasis was achieved. Peritoneal wash was given. Figure 3. Fibroid removed with myoma screw. Figure 4. Fibroid and left tube with ectopic after its removal. Uterine myomas are observed along with pregnancy more frequently nowadays than in the past because many women are delaying pregnancy until they are in their late thirties, which is the time for an increased risk of myoma growth. Also, the use of sonography has improved the diagnostic capability of detection of even smaller myomas and has increased our knowledge of myomas in pregnancy. Enucleation of the fibroid is technically easier in gravid uterus owing to greater looseness of the capsule. There are very few reports of intramural myomectomy with management of ectopic pregnancy done at the same sitting. 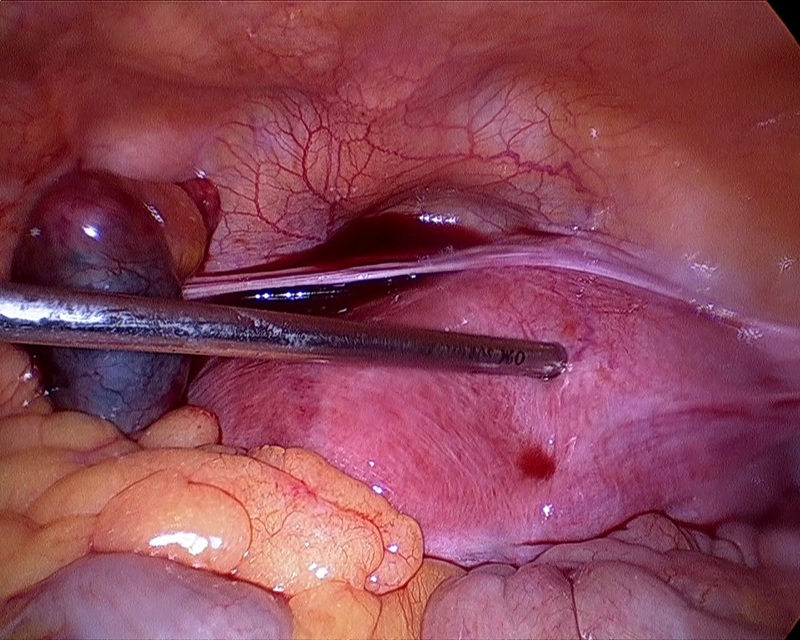 Davison et al in 2013 have reported a case of hemoperitoneum secondary to bleeding from a pedunculated fibroid along with concomitant tubal abortion; they performed an uncomplicated laparoscopic myomectomy and concluded that minimally invasive surgery was safe and feasible for pedunculated fibroids even in the presence of hemoperitoneum. Katz VL, Dotters DJ, Droegemeuller W. Complications of uterine leiomyomas in pregnancy. Obstet Gynecol 1989;73(4):593-6. Alsuleiman SA, Grimes EM. Ectopic pregnancy: a review of 147 cases. J Reprod Med. 1982; 27(2):101-6. Davis JL, Ray-Mazumder S, Hobel CJ, Baley K, Sassoon D. Uterine leiomyomas in pregnancy: a prospective study. Obstet Gynecol 1990; 75(1): 41-4. Kwawukume EY. Myomectomy during cesarean section. Int J Gynecol Obstet 2002; 76: 183-4. Davison JZ, Bennett TA, Jaffe IM. Laparoscopic myomectomy for hemoperitoneum from a uterine leiomyoma with concomitant tubal abortion: a case report. J Reprod Med. 2013; 58(9-10): 438-40.